The Duke of Rathburne, one of the famous Rakes of St. James, has taken on Marlena Fast as his ward. It's a challenge to try to be a gentleman, especially when he's attracted to her and realizes that she is just as attracted to him. Amazon affiliate links are used on this site. A free book was provided for an honest review. 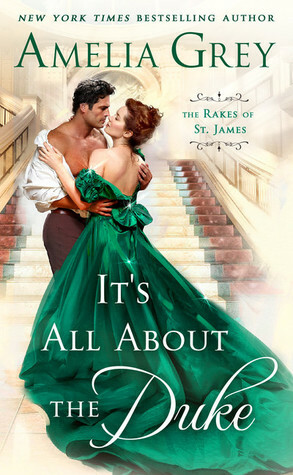 It's All About the Duke is part of the Rakes of St. James series, but it's not entirely necessary to have read the others in the series. The wager that the Rakes had made years before is spelled out and referred to often, especially in the context of Marlena's secret: she is the Honoria Truth of the scandal sheets, and had written extensively about the Rakes as a sort-of revenge on behalf of her best friend and neighbor's sister. Of course, her desire to maintain her weekly column is at odds with her growing attraction and desire, and her loyalty to her friends is an admirable trait. The fact that Rath is Marlena's legal guardian doesn't seem to make this a squicky kind of relationship because it was a sudden change of guardianship at the start of the book, and he leaves the decision up to her. Rath doesn't take advantage of the power differential and makes sure he has consent for every stolen kiss. Marlena's steadfast loyalty despite her tendency to be dismissive of some society norms is part of what leads to her happily ever after, which is a wonderful thing to see in stories like this. Often, there's some kind of contrived plot device to get the hero and heroine together, and here it's because her friends are just as loyal to her as she is to them. Everyone here gets a happily ever after, and it ties up the trilogy of novels very well. Born and raised in New York City, M.K. French started writing stories when very young, dreaming of different worlds and places to visit. She always had an interest in folklore, fairy tales, and the macabre, which has definitely influenced her work. She currently lives in the Midwest with her husband, three young children, and golden retriever. Get even more book news in your inbox, sign up today! Girl Who Reads is an Amazon advertising affiliate; a small commission is earned when purchases are made at Amazon using any Amazon links on this site. Thank you for supporting Girl Who Reads.